You just took a call from your child’s doctor. It wasn’t his staff calling with the results, it was the doctor himself – which we all know only means that the test came back positive for (fill in the blanks). You hang up the phone, maybe you remembered to wish him a “good day”, or not – regardless this is NOT a good day, so what does that matter? The news you have feared, the moment you thought would be the worst day of your life is here – right now! You are in the middle of it… still breathing – barely. What are you supposed to do next? Who do you tell? Do you want to talk to your spouse, your own mom, your childhood friend or the woman you met two weeks ago in the support group? She seemed nice… your kids share the same diagnosis, although her child has been battling this for much longer. You take a deep breath, send her a quick text with a 10 word or less summary of the phone call with the doctor. Your first phone call is then to your spouse because of course, he needs to know. While you are on the phone with him your new medical-mom-BFF calls. She got your text and picked up the phone RIGHT AWAY! You breathe a sigh of relief – she is your “OASIS”. Over the next few days and weeks, the two of you become really close. You are two mothers traveling on the same painful and unimaginable journey. This type of misfortune shouldn’t happen ONCE – EVER – and here the two of you are – sailing on the same big dark deep ocean. You are navigating by the stars – barely, without a compass or other directional aid. You are overwhelmed at how “the system” is failing your family, how the insurance company seems to be working against you. You long for answers from doctors, and instead, you get a never-ending parade of “inconclusive”, “wait and see” and some “let’s try THIS approach”. – As you are mid-typing you receive a message from HER – checking up on YOU… the two of you are in sync – on the same emotionally draining and physically exhausting schedule. Your oasis knows intuitively when you are lower than low, when you are bluer than blue. She senses your stress and heartbreak – and she is always there – without judgment and without ceasing. Her prayers are timely and her hugs are comforting. In the friendship lottery you just won the Super Powerball – although without your common denominator the two of you might never have met. Your paths would have never crossed, nor would either of you have needed this intense friendship. Without the medical bond, the two of you appear to be opposites. With the shared diagnosis, similar family dynamics and medical nightmares the two of you are twins separated at birth. To all my fellow medical moms, I wish that each and every one of you find your own oasis – the friend who becomes your safe haven. The place you can vent, rage, scream, cry, hope and dream without judgment, regret or restraint. 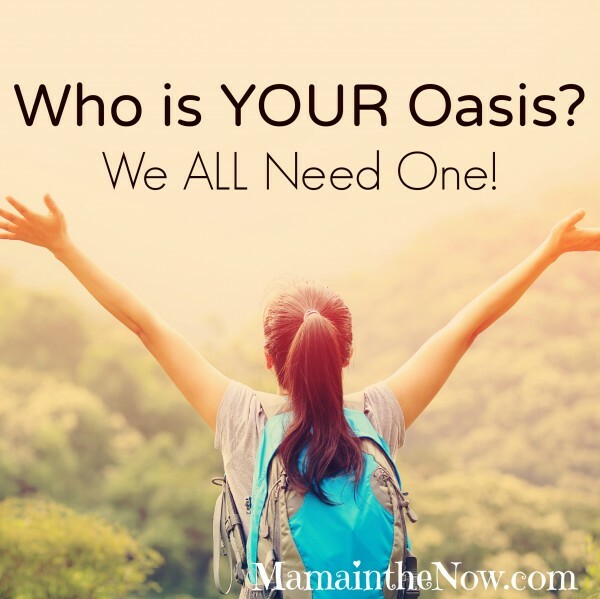 May your oasis be your village and your “special place.” May she be the person who assures (and reassures) you that this “new normal”, although very painful and heartbreaking now – one day will be worth living. Once the dust settles on the worst phone call of your life, when the appointments fade into a routine without surprises, after your life is on cautious cruise control and the proverbial “other shoe” is no longer dangling precariously off your big toe – you look around and thankfully you see that your oasis is still sticking around. She is in your life for good – as the two of you “stay strong”, fighting any and every negative force together. One day you will share the story of how you met with your then adult (and thriving) children. This is beautiful Tove! Sharing with our readers. Such a great post! I have a couple, sending to them now! You’re mine too Kristen! Thanks for tagging me!! Such a beautiful post, Tove! I can’t imagine being a mom whose kids have crazy medical needs. I already freak out because of the tiniest reasons we go to the doctor. Oases need one another for sure! My oasis is my dear sister-in-law who is also my friend and a nurse!